Did you know that over 60 million households keep dogs in the US? Per household they are the most popular pet in the US by far! So if you’re looking for white dog breeds, you’re in the right place. In this list we have collected the 13 most popular white coated dogs. They range from small apartment friendly pets to large independent dogs best kept outside; we have tried to offer something for everyone. 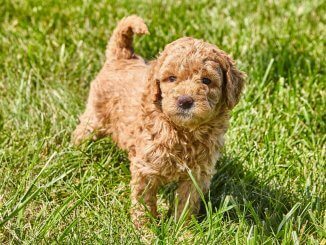 We have prioritized easy to care for and beginner friendly dogs in our list so most of the dog breeds mentioned below will be suitable for most people. With that said, let’s get started on our list of 13 most popular white dog breeds. The Samoyed is perhaps the most well-known big white fluffy dog that ever existed! It was originally bred in Siberia to help hunt and tow sledges. It is a large sized dog with a thick white double coat. The outer coat is long and fluffy and the guard coat is oily; this helps to keep them warm in sub-freezing conditions. As a working dog they are head strong with boundless energy levels. However this doesn’t mean they can’t be a loving family pet. With the right owner they will become a loyal, loving family member. 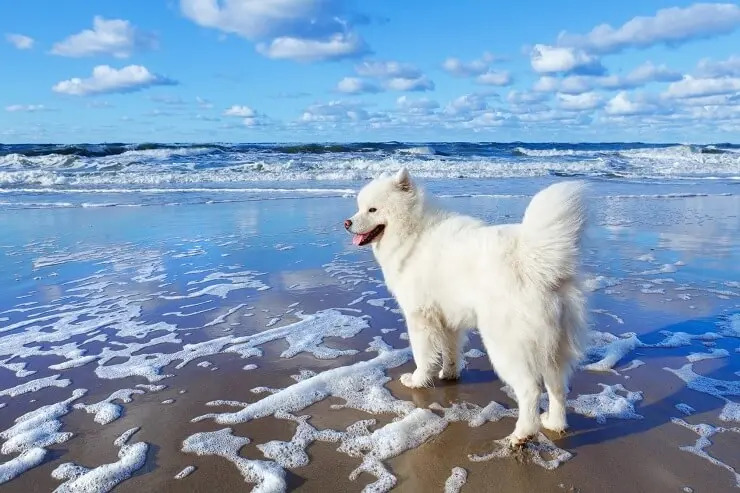 You should expect your male Samoyed to grow up to 23.5 inches and 60 pounds, with a female growing to 21 inches and 50 pounds. If you are interested in the Samoyed you should know they also happen to be fairly expensive. The Maltese is one of the most well-known small white dogs. It’s famous for its long, straight, smooth coat and fearless attitude towards larger dogs. If you’re looking for a low-shedding dog, the Maltese could be for you as their coat rarely sheds. They are loving toy dogs who have been kept and admired for centuries now. Their temperament towards humans is fantastic; however they can be aloof towards other dogs. You should expect a male Maltese to grow up to 9 inches and 7 pounds, with females standing up to 7 inches and weighing less than 7 pounds. We are now in the realms of aristocracy. The Bichon Frise was originally bred for French aristocrats, however during the revolution, they were all but abandoned. They are known for their immaculate white curly appearance, almost looking like a toy. You should know that if you intend to keep one you should be prepared to pay out on grooming expenses as they will need regular haircuts. 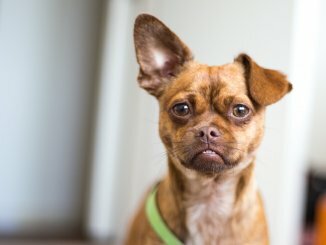 This dog should not be left alone for any extended period of time though as it becomes very attached to its owners and can become destructive when left. 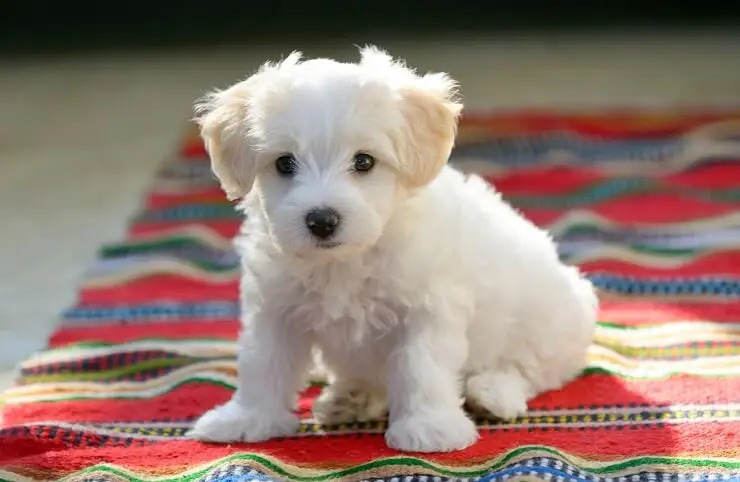 You should expect a male Bichon Frise to grow up to 12 inches and 15 pounds, whereas females should reach 10.5inch and 11 pounds. It’s small, it’s white and it’s fluffy. Say hello to the Pomeranian. Like the Bichon Frise mentioned above, we are also dealing with dog royalty here. It is a favorite of royals gone by. 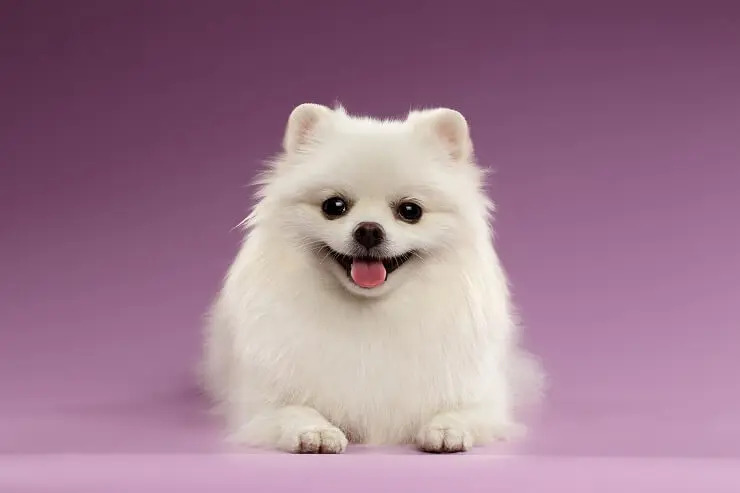 Its foxy face, vibrant personality and magnificent coat, all have contributed into making Poms one of the most popular toy breeds in the world. In terms of size, males should reach a maximum of 7 inches and 7 pounds, whereas females should be up to 6 inches and 5 pounds. You can expect your Pomeranian to live up to around 16 years old. Here we have one of the largest white dogs around. 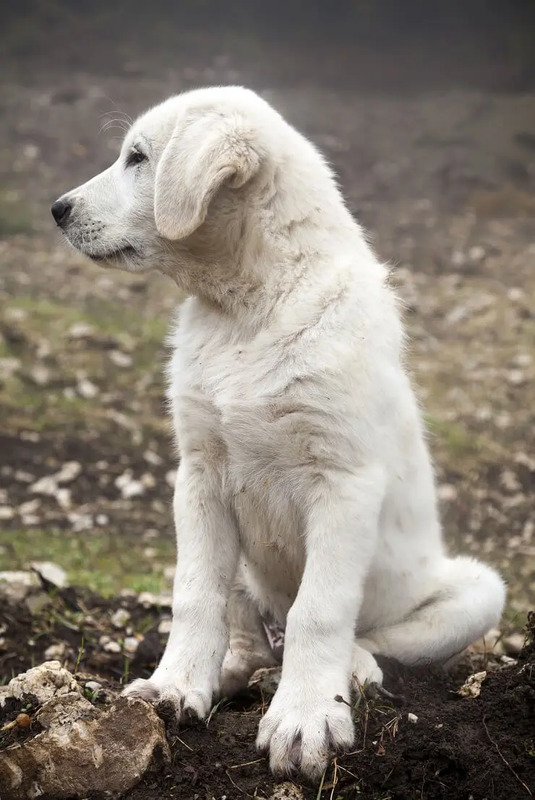 The Great Pyrenees can weigh in at a whopping 160 pounds and can grow up to 32 inches tall. You should expect females to be not much shorter at 29 inches. They were originally bred to defend sheep and other livestock on snowy mountaintops, however today they have a softer personality and make attentive home protectors. With monk-like calm disposition they can be confused as docile, however when needed they leap into action. Their thick white coat is weatherproof; however it isn’t solid white and usually is accompanied by various shades of tan or badger. Although their history is as a working dog, they can now make a loving family member. They are large, intelligent and head-strong, so whoever is interested in a Great Pyrenees needs to be prepared to give this dog the time they need to appropriately train them. 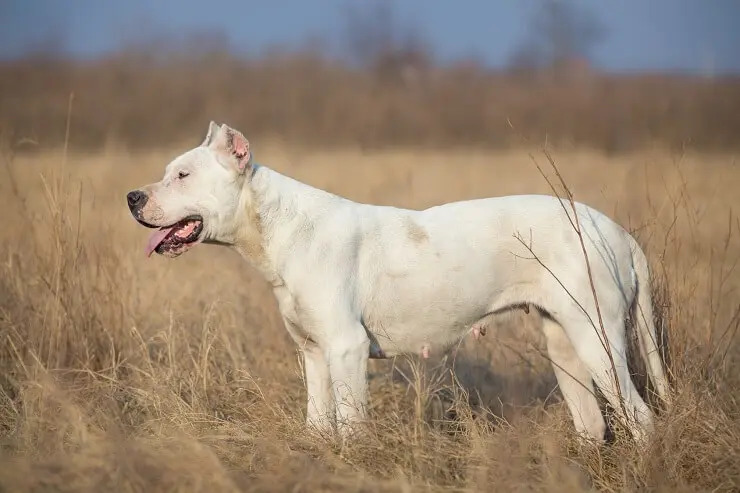 Without a doubt the Argentine Dogo is an intimidating dog to look at. Their large muscular frame and booming bark are enough to send many people running. However behind their appearance, is a loving and affectionate dog. In many ways this is a dog of contradictions, ferocious outside, yet loving inside; fearless yet emotional. It was originally bred in Argentina by Antonio Nores Martínez to hunt big-game. Antonio also wanted a dog that would innately protect its owner; the Argentine Dogo does this. Due to its origins, it is banned or restricted in many countries now so make sure to check local regulations before considering one. Its smooth white coat covers all 100 pounds of muscle and it should reach up to 27 inches tall. However nearly all Huskies will have white on at least some part of their body. Like the Akbash Dog, you should be prepared to spend at least two brushing sessions with your Husky each week. Also twice a year they will shed their coat completely so they aren’t ideal for people suffering with allergies. 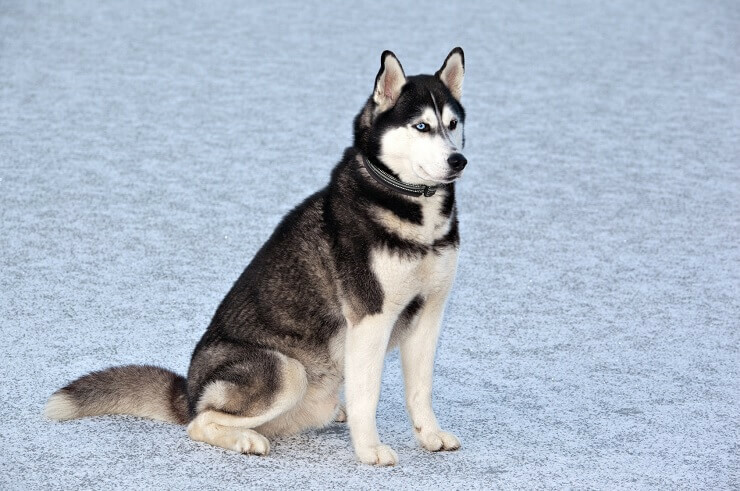 The Siberian Husky was originally bred to hunt by the Chukchi people. They are very intelligent dogs and also independent. You will need to be their pack leader and earn their respect. Nothing is given from a Husky, it needs to be earned. If you are thinking about getting a Husky you should make sure you lead an active outdoor lifestyle as they have lots of energy they need to burn off. Without lots of daily exercise they will become destructive. Males should grow up to 22 inches and weighs up to 50lbs, with females growing to 20 inches and weighing up to 40 lbs. You can find out more about the Husky here. The Akbash dog was bred back in 300 B.C. in Turkey and was intended to be used as a livestock guardian. Its temperament, size and strength all make it an ideal candidate to bond with and watch over flocks as they grazed on Turkish mountains. If we could use two words to describe this dog it would be suspicious and caring. Remember they were originally bred as working dogs and as a result are highly alert to strangers. Their coat is white allover except for their head which can sometimes have a shade of biscuit to it. You should be prepared to groom this dog every week and up to three times a week when they are shedding. Your Akbash should grow to around 33 inches tall and can weigh up to 140 lbs. Females are slightly smaller at 29 inches tall and 120 lbs. The Japanese Spitz is a small but fiery dog. Don’t let their size deceive you; they are a natural guard dog with personality that far surpasses their physical stature. Spitzs need lots of exercise and have lots of energy. You should expect to exercise them for at least 1 hour every day otherwise they can become restless. They are ideal for people who love the look of the Samoyed but don’t want a large dog. You can expect a male to grow up to 14.5 inches and 15.5lbs with females being 13 inches tall and weighing 13lbs. 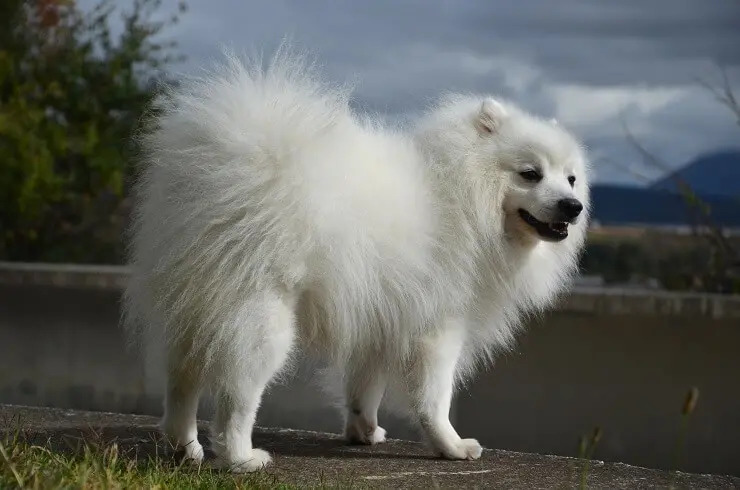 If you’re looking for a mid-sized companion dog with a fluffy white coat the Japanese Spitz could be the dog for you. 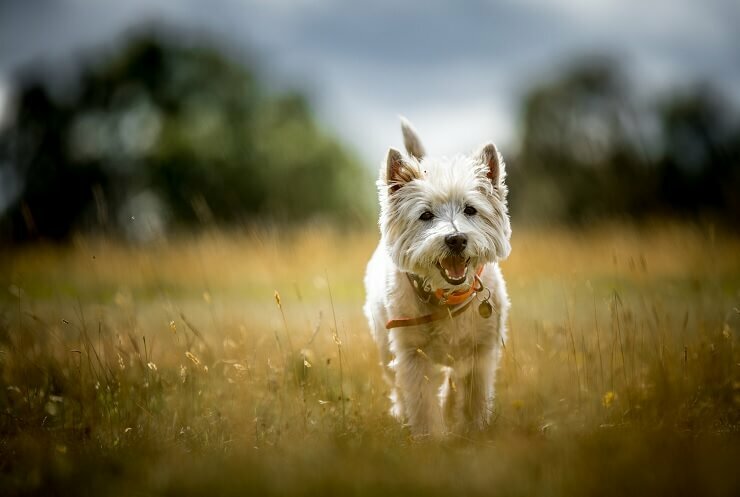 The West Highland White Terrier, also known as a Westie, was initially bred to hunt rodents. They are a small, energetic dog with incredible amounts of self-confidence. They are the epitome of a small dog in a big dog’s body! They have a rugged double white coat which helps keep them warm in their native Scottish highlands. You can expect your Westie to grow up to 11 inches tall and weigh up to 20 lbs. Females are a touch smaller at 9.5 inches and weighing up to 18 lbs. They make a great companion however you should be careful with them around children. They have a high prey drive and don’t deal well with rough handling. Welcome to one of the most recognizable dog breeds in the world. Since their Hollywood appearance in 101 Dalmatians in 1996 they have captivated both children and adults alike. 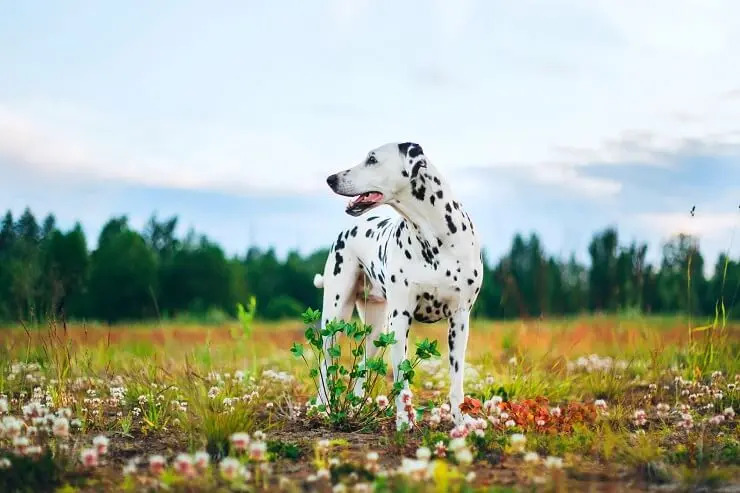 Their spotted white and black coat is instantly recognizable. You can expect a male to grow up to 24 inches and weigh up to 90 lbs; with females growing up to 22 inches and 70 lbs. They are a strong, active dog who need plenty of exercise and engagement. 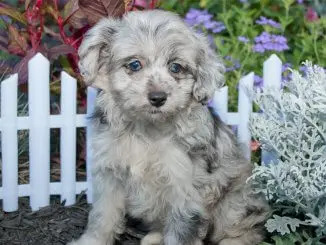 Interestingly the Havanese is the only native dog breed of Cuba; they were actually named after capital city of Cuba, Havana. 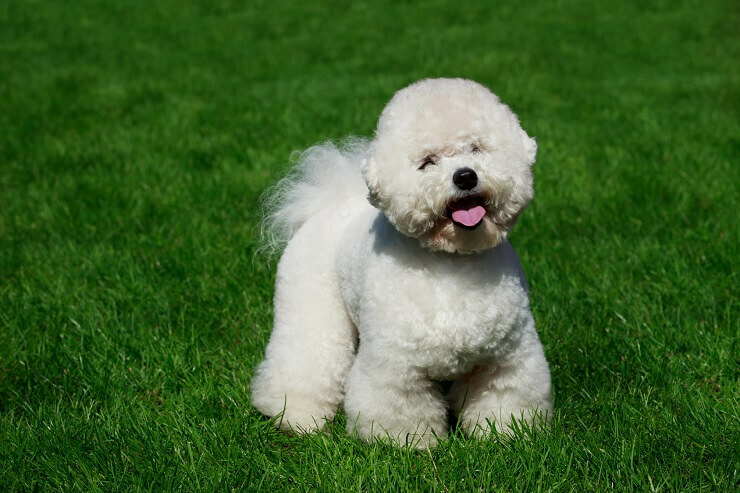 It is also a cousin of the Bichon Frise which we mentioned earlier on in this list. They have a lively personality and love spending time playing with you; this is probably why they are currently seeing a boom in popularity amongst young city dwellers. They come in a variety of colors including Black and Silver, Red and Fawn. However they are most well known for their white coat. 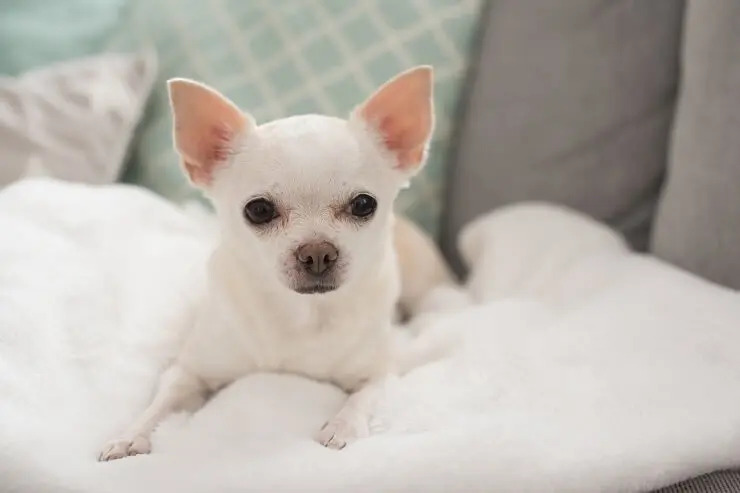 No list on white dogs would be complete without mentioning the Chihuahua; without a doubt the most famous toy dog around. They are often described as entertaining, amusing and the soul of the party. Their oversized personality is endearing, however they are needy and require lots of attention. Due to their tiny size they are known to suffer from a variety of ailments, so make sure to research this thoroughly before purchasing one. Males can grow up to 9 inches tall and weigh a maximum of 6 pounds. We hope this list of the best 13 white dogs has helped you decided which breed of dog you should get. We have tried to offer something for everyone. From a small apartment dog like the Havanese, to a strong independent dog like the Husky. Remember to read our complete breed profiles here, to help you better understand each dog and whether they are suitable for you.